For Israeli Prime Minister Benjamin Netanyahu’s legion of critics, it was all just a big distraction from the main event…writes Jonathan S. Tobin/JNS. As far as they are concerned, Netanyahu’s trip to Washington, D.C., was just a break from reality. With new corruption charges being lodged against him by the police and with former staffers turning state’s evidence, the prime minister’s enemies are sure that the end of their nemesis is in sight. That’s why they are quick to dismiss his warm embrace by the Trump administration and the ecstatic reception he received at the annual AIPAC conference as nothing but theatrics that won’t help him escape the legal peril that seems to be inexorably closing in on him. They may be right. The initial charges about Netanyahu taking cigars and champagne from rich friends, as well as his futile talks with a publisher about trying to get better media coverage, seem trivial and unlikely to ever result in a conviction. But the newer accusations about other alleged influence-peddling plots seem serious. More to the point, if the police are determined to criminalize every political transaction the premier or his wife has engaged in over the past nine years, it may be inevitable that sooner or later, they might discover something that will stick. Nevertheless, we’re still a long way from Netanyahu being forced out. Whether he decides, as some think likely, to push for early elections to solidify his hold on office to better fend off legal challenges or simply tough it out until the end of his term in late 2019, the prime minister is looking to pose as the indispensable man of Israeli politics. The widespread belief that no one else on the current scene—either within the governing coalition or the opposition—with Netanyahu’s combination of security gravitas, economic expertise, diplomatic experience and political talent is the best argument for allowing him to stay in power as long as he can, in spite of the tremendous legal pressure being put on him. Viewed from that perspective, Netanyahu’s trip to the United States was not a distraction. On the contrary, it was a key part of a strategy that seeks to convince Israelis to ignore the police charges and left-wing press howling for his blood, and to keep in place the only person capable of doing all that he can do in the way that he does it. As a matter of principle, the answer must be no. In a democracy, no single individual is indispensable—no matter how talented or special his or her attributes might be. Should Netanyahu be forced from office at some point in the next year or two, the Israeli state will not collapse. Nor will the U.S.-Israel alliance. Netanyahu’s successor will be cheered by delegates at future AIPAC conferences and will still be received cordially at the White House. It might even be to Israel’s benefit, to some extent, since most of the U.S. foreign-policy establishment and media wrongly believe that Netanyahu’s toughness is a major obstacle to peace. Replacing him with someone less truculent and less widely despised would make it slightly easier to point out that the reason peace hasn’t been achieved is due to the Palestinians’ refusal to accept Israel’s legitimacy and end their century-long war on Zionism. But, as Netanyahu demonstrated this week, there is still no one quite like him. Netanyahu’s floorshow at the AIPAC conference can be dismissed as show biz and his rhetoric criticized for recycling the same arguments he’s been selling the world for the last 25 years. But no rival could have pulled off the same kind of tour de force speech that he did at AIPAC, as well as the many times before that he’s wowed the pro-Israel community and U.S. political establishment. There’s more to statecraft than giving speeches, but Netanyahu’s ability to convey the case for Israel and against its foes in crisp, concise American English is unmatched in the history of his country. So is his knowledge of U.S. politics and its players, combined with resilience and charisma that have been so effective in rallying the pro-Israel community behind his policies. Just like in Israel, not everyone in America loves Bibi. Jewish liberals regard him with suspicion and long for someone who, like the late Shimon Peres, will ply them with the sort of platitudes about coexistence and a bright future—without conflict—that they long to hear. 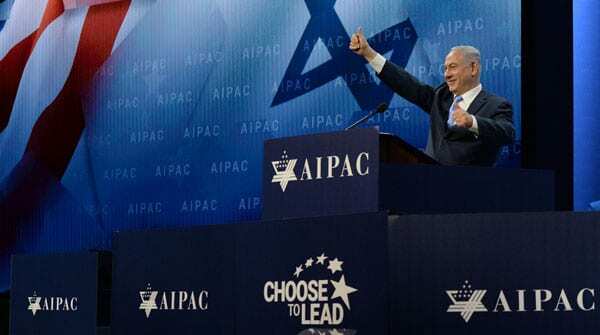 Netanyahu’s hard-nosed evaluations of Palestinian intransigence and threats from Iran are firmly tethered to reality in a way that the left’s patent nostrums about the chances for peace are not; still, they will never win him the cheers of liberals and the mainstream media. The person who succeeds Netanyahu will be hard-pressed to match his communication skills, his savvy or his willingness to tell hard truths to the world. As the less than scintillating but well-meaning performance of Zionist Union/Labor leader Avi Gabbay at this year’s AIPAC conference and the similarly lackluster presentations of Yesh Atid leader Yair Lapid have shown, Netanyahu’s opponents lack the stature to represent the country at the same level. If the polls are to be believed, Israeli voters feel the same way since they seem prepared to give Netanyahu and his coalition another term in spite of the deluge of negative press he’s gotten over the corruption issues. Netanyahu’s trip demonstrated that while anyone can be replaced, in his case, that’s going be a tough act to follow.